"A symphony of howls from all 7 of the wolves." It's absolutely remarkable to behold, if a little chilling. Wolves have all sorts of tricks in their vocal repertoire (they can yelp, growl, whine and whimper) but it’s the howl that’s their signature sound. The howl of the wolf can be heard from miles around. It is the trademark by which these very animals are known. A wolf may howl for a variety of reasons but the main one involves being able to identify where the rest of the pack it belongs to happens to be. These howls can also be identified as a way to warn other packs in the area that they are stepping into territory that has already been claimed by another.Howls play a key role in a wolf pack. Some experts have suggested that the vocalization strengthens the bonds of the group, and chorus howls can end feuds between wolves, according to the PBS show Nova. Although to the untrained human ear all the howls may sound alike, each wolf has its own individual sound which allows pack mates identify one another. 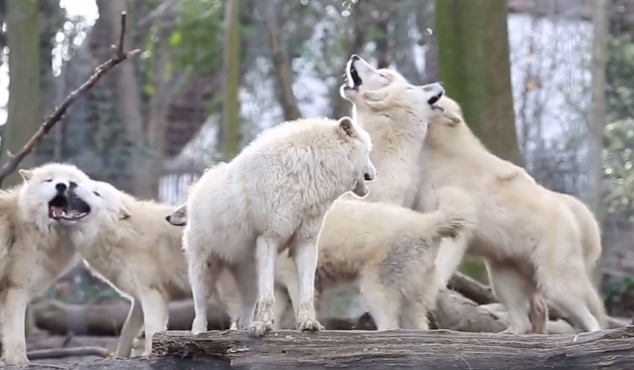 Responses to "Hauntingly beautiful video shows pack of 7 Polar Wolves howling in perfect unison "
Looks like they may be teaching one or two of them to me. Surprised a little @ the high vocal range maintained by all.